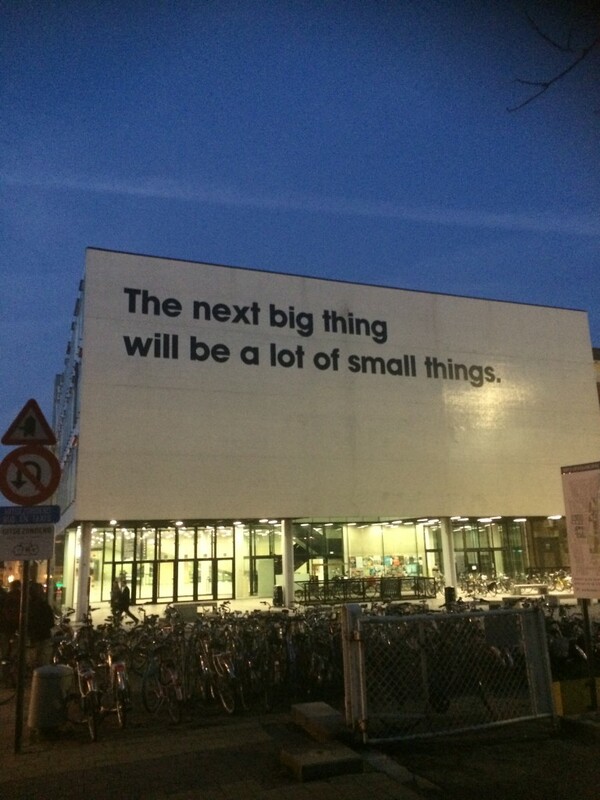 Inspirational quote on the side of a University of Ghent building, St. Pietersnieuwstraat 33. The adoption of IIIF (International Image Interoperability Framework) has been gaining momentum over the past few years for digitised images. Adoption of IIIF for serving images allows users to rotate, zoom, crop, and compare images from different institutions side by side. Scott and I attended the IIIF conference in Ghent earlier this month to learn more about IIIF, so we can decide how we can move forward at the University of Edinburgh to adopt IIIF for our images. On the Monday we attended a technical meeting at the University of Ghent Library, this session really helped us to understand the architecture of the two IIIF APIs (image and presentation) and speak to others who have implemented IIIF at their institutions. 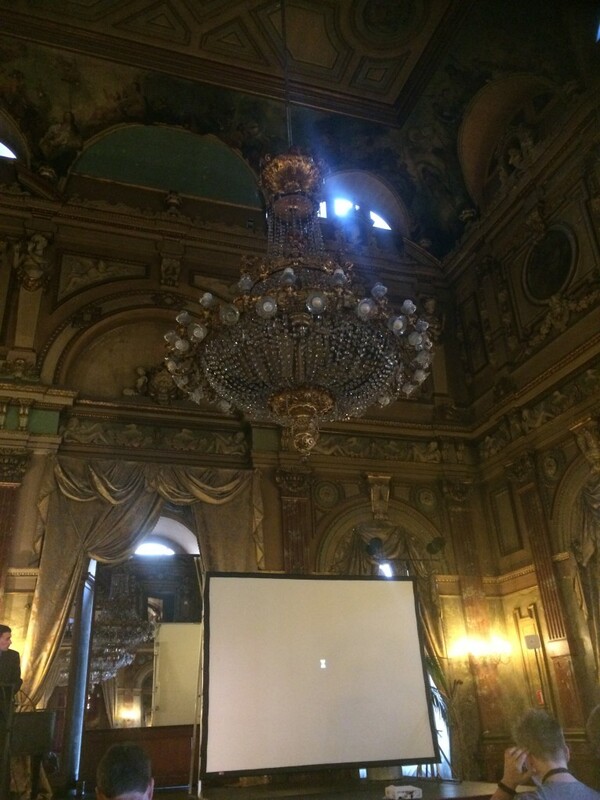 The main event was on Tuesday at the beautiful Ghent Opera House, where there were lots of short presentations about different use-cases for IIIF adoption and the different applications that have been developed. If you are interested in adoption IIIF at your institution I recommend looking at Glen Robson’s slides on how the National Library of Wales has implemented IIIF. I can see myself coming back to these slides again and again, along with those on the two APIs. Whilst we were in Ghent there was a timely update from LUNA Imaging, whose application we use as an imaging repository on their plans to support IIIF. Thanks to everyone we met in Ghent who was willing to share with us their experiences of implementing IIIF and to the organisers for a great event in a beautiful city (and our stickers). Introducing ArchivesSpace for researchers and public users, as well as the administrative side for our Archives Team within the Centre for Research Collections, has been an ongoing project for the last 18 months. It has taken us a while to get the service live for a number of reasons and we have learnt lots along the way. ArchivesSpace is free open source software and is easy to set-up using Jetty and MySQL, however some of our requirements have meant getting to grips with the underlying set-up and APIs of the system. We have also joined ArchivesSpace as paid members as this enables us to get additional support through documentation and mailing lists. We had an existing MySQL database containing thousands of authority terms collected by the Archives Team. 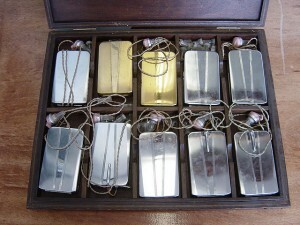 It was very important for us to keep these and import them into our ArchivesSpace instance. We imported the subjects using the ArchivesSpace API. Learning how to use the API was made easier by the Hudson Molonglo Youtube videos. We have written simple PHP scripts to allow us to connect to the ArchivesSpace backend and import the subjects and agents from MySQL database exports of our existing authority terms. After some trial and error we have imported 9275 subjects and 13703 agents into ArchivesSpace. For a while the authorities were not linking with the resources migrated into ArchivesSpace by the Archives Team, via the EAD importer. To enable the authorities to link we had to make modifications to the EAD importer in the plugins. The changes are available to view on our Github code repository. We also made changes to the importer to allow us to get a greater understanding of why EAD imports were failing. The reasons why EAD failed to import have changed as new versions of ArchivesSpace were released and the EAD importer is quite strict. 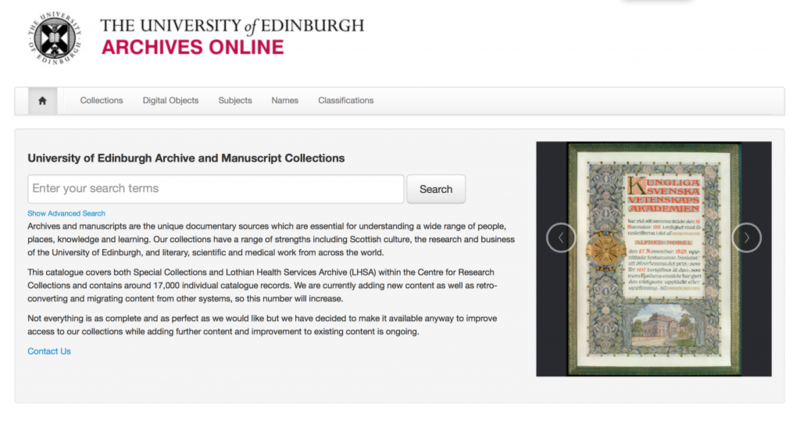 The Archives Team migrated 16836 resources (including components) for launch on 9th June. We have also used the API to run through all resources imported from EAD and publish them. By default they were not all published and a lot of the notes and details of the resources were hidden from the public interface. Therefore being able to script the publishing was a great time saver. We decided to run ArchivesSpace under Tomcat as it is a web server that we have a lot of experience with. However, ArchivesSpace runs easily under Jetty and running it under Tomcat has caused us some headaches, due to URLs issues and the fact that the Tomcat installation script adds a lot of files to Tomcat and not just the web apps. We have customised the user interface for the administrative and public front ends of ArchivesSpace. These changes were made within the local plugin. The look and feel has been made to fit in with our other services such as collections.ed and the colour scheme of the University. This was relatively straightforward as ArchivesSpace UI is based on Twitter Bootstrap. Unfortunately the public UI images were displaying when running in Jetty but not in Tomcat. After some copying of files the images appeared. It has taken longer than we had initially hoped to launch ArchivesSpace for a number of reasons. Primarily as early adopters of software there were issues that we did not foresee when the initial version was made available. The ArchivesSpace members mailing list is very active, as it is a new system there are lots of shared questions from those getting to grips with the system and working through their implementation. 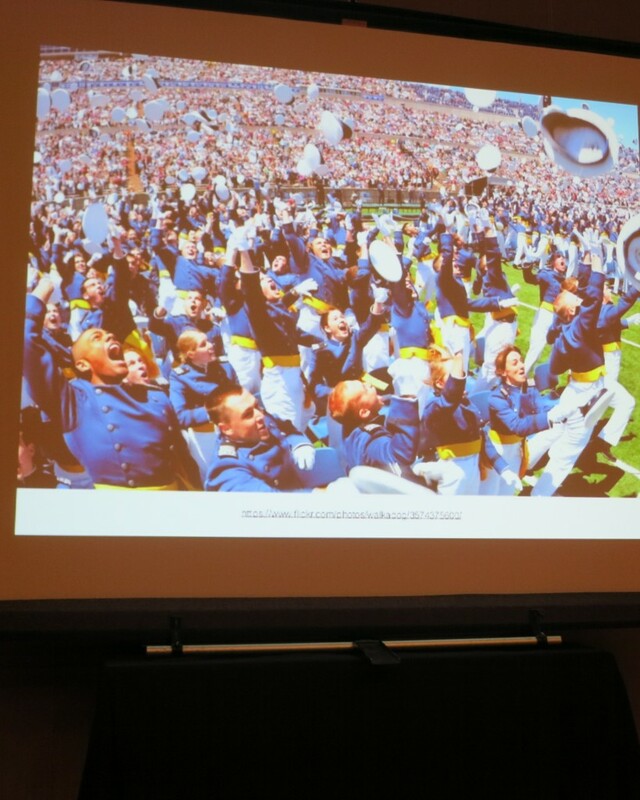 ArchivesSpace, particularly Chris Fitzpatrick, have helped steer us in the right direction and shared code. The migration of EAD has been a huge task that has been undertaken by Deputy Archives Manager, Grant Buttars, it has been great to work with him and to get a greater understanding of the format of EAD when resolving issues with failing imports. We still have lots to do with the system to leverage its full functionality and fully showcase our amazing archives collection through links to http://collections.ed.ac.uk and our image repository. So watch this space. 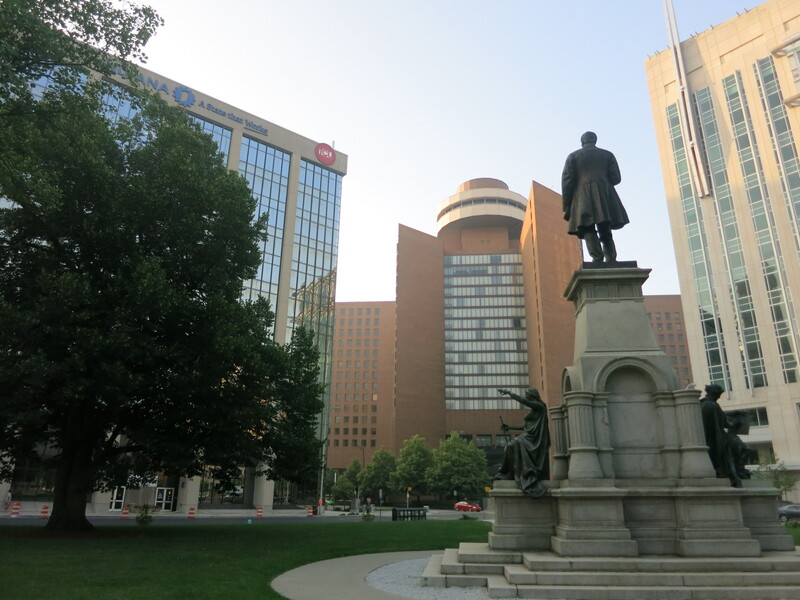 Last week I was very fortunate to attend the Open Repositories Conference in Indianapolis. 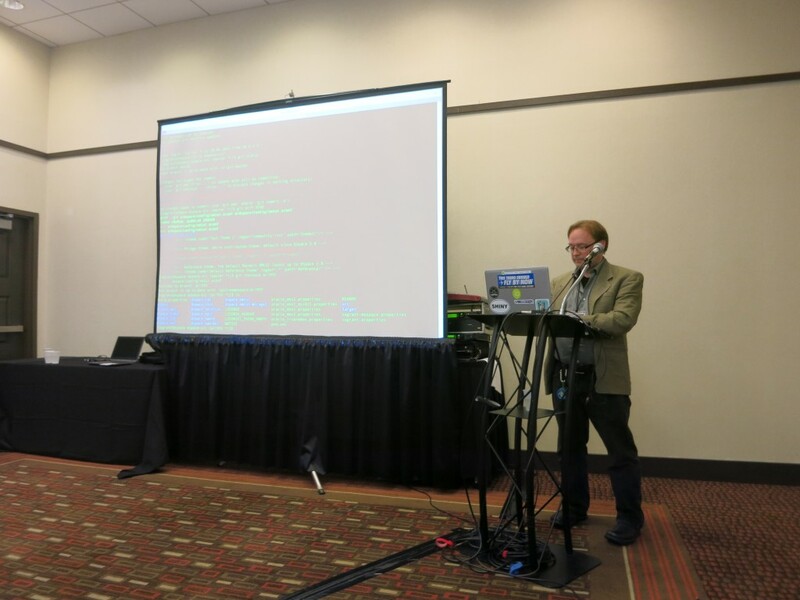 Where I was co-authoring a presentation on metadata games with Tiltfactor, Dartmouth College, and also co-chairing the new Developer Track and Ideas Challenge at the conference with Adam Field from EPrints Solutions, University of Southampton. It was very packed few days as the conference has moved from five to four days with more tracks running simultaneously. This unfortunately meant I didn’t get to see all the presentations I want to see, but all the papers are online and the main conference room was recorded. The keynote speakers were Kaitlin Thaney (Mozilla Science Lab) and Anurag Acharya (Google Scholar) who both gave very interesting and very different presentations. Kaitlin managed to hold the whole room’s attention despite having to talk via Skype, due to problems with flights. Their slides are available here and the videos should be online soon. Anurag’s talk was very specific on how repositories need to be designed to work with Google Scholar and has already created lots of debate over the use of PDF cover pages. The Developer Track was new for OR15, it was designed, along with the Ideas Challenge, to stop the developers who attend the conference being torn between writing code for a competition and attending conference sessions. There were lots of demos and it was great to see no one having to apologise for screens of code, XML and terminal windows. I found the sessions really practical and have a list of things to try now I am back in the office, starting with Hardy Pottinger’s Vagrant-DSpace. The Ideas Challenge, was designed to be less time intensive that the previously run Developer Challenge but still encourage people to discuss issues they would like to resolve, meet new people, and have a fun session where audience participation was encouraged. Adam and I created an example challenge and solution based on the Sound of Music Idea’s Challenge Slides. We had 9 entries to the challenge this year and thanks to Adam’s scoresheet there were no long deliberations and a clear winner was identified after our judges handed in their scores. Congratulations to the winners Blog post about the challenge winners. My presentation on Crowdsourcing Metadata Session Slides was in front of a packed room. Helped by my talk being sandwiched between Rob Sanderson from Stanford University and Simeon Warner from Cornell University. I got some great questions and hopefully passed on the message that engagement is just as important as developing the tools. My co-authors at Tiltfactor launched their new OCR verification games last week http://beanstalkgame.org is very addictive (you have been warned). There was a lot of discussion during the Monday’s DSpace DCAT and Committer meeting and also during the DSpace Interest Group about the ambitious work planned for DSpace 7 in 2016. The University of Edinburgh manages DSpace repositories on behalf of the Scottish Digital Library Consortium and Stuart Lewis is a DSpace Steering Committee member. I hope that these plans get the support they require within the DSpace community to make them happen. Hardy Pottinger has written a blogpost about the conference and his ’stuff to check out later’ to take away from the conference and try is similar to mine so I won’t repeat it. Although I would add Vagrant and implementations of IIIF. Both of which have been on my todo list for a while, but I really really want to find time to play with them now. Thanks to Sukie at Tiltfactor and Adam for lots of Skype calls over the past few months, and to the Open Repositories organisers for a great week. ‘Innovation’: the Emperor’s new clothes? 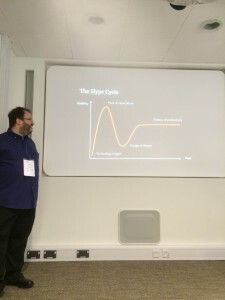 Scott and I travelled down to Cambridge last week to speak at the Museum Computer Group’s Spring Meeting, ‘Innovation’: the Emperor’s new clothes? It was a very informative day that began with Peter Pavement, SurfaceImpression, giving us a history of digital innovation in museums. Including the first audio guides and the Senster, which was the first robotic sculpture to be controlled by a computer. 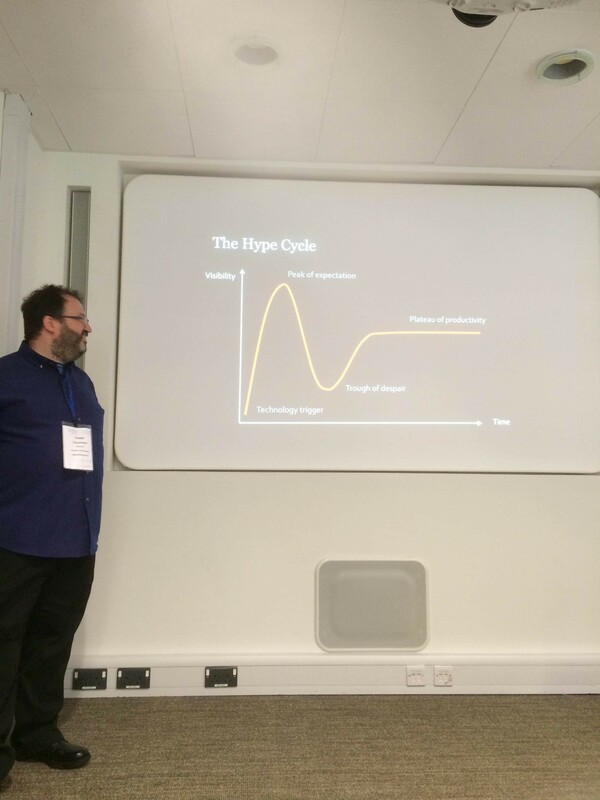 Peter discussing the Hype Cycle, where would you place new technological innovations? Scott and I then discussed the work we have being doing at Edinburgh to get our collections online through Collections.ed, which has been an iterative process starting off with four online collections launched May 2014, we now have eight collections online following the recent launch of our Iconics collection. We have also recently made a first import into Collections.ed of 776 unique crowdsourced tags we have obtained through Library Labs Metadata Games and those entered into Tiltfactor‘s metadata games. The slides from our presentation are available on ERA http://hdl.handle.net/1842/10415 and have a film theme running through them. In the afternoon Lizzie Edwards, Samsung Digital Discovery Centre, British Museum, lead a practical session where we had to think about how we could use new technologies in Museums. Jessica Suess, Oxford University Museums, spoke about their ‘Innovation Fund’ programme and how it had led to new ways of working and new collaborations with colleagues. She mentioned one project using Ipads as Art Sketchbooks http://www.ashmolean.org/education/dsketchbooks/ which was also showcased in a lightning talk. Last Friday, Gavin, Caroline, Matthew and I attended a Library Gamification day organised by the Scottish Academic Libraries Cooperative Training Group. 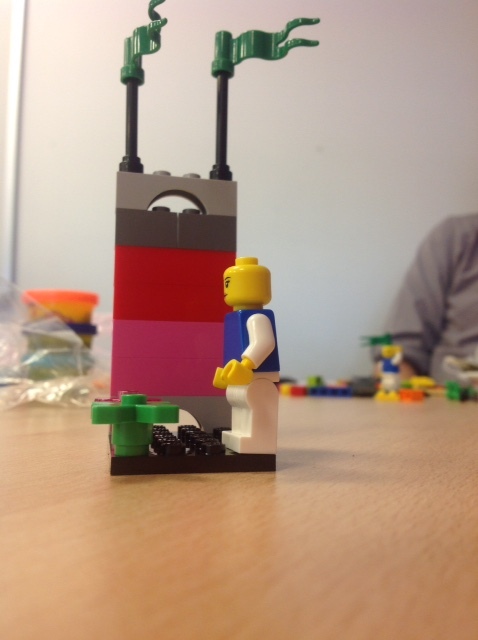 Andrew Walsh, from the University of Huddersfield gave us an introduction to gamification and then gave us all a pack of Lego with the challenge to build our ideal librarian. We then play ed different games to discover the different game mechanics we could use when building our own library games later in the day. The Lego was again utilised to form groups for the rest of the day based on common issues we wanted to address. Here’s my Lego model of a problem we face here at the University of Edinburgh, the Lego wall represents the Main Library, with the pink and red blocks being the floors most undergraduates visit and the grey floors the Lower Ground Floor, fifth and sixth floors containing the rare and unique collections that are unknown to many of our students. We then created board and card games based on the common issues we face in our libraries. 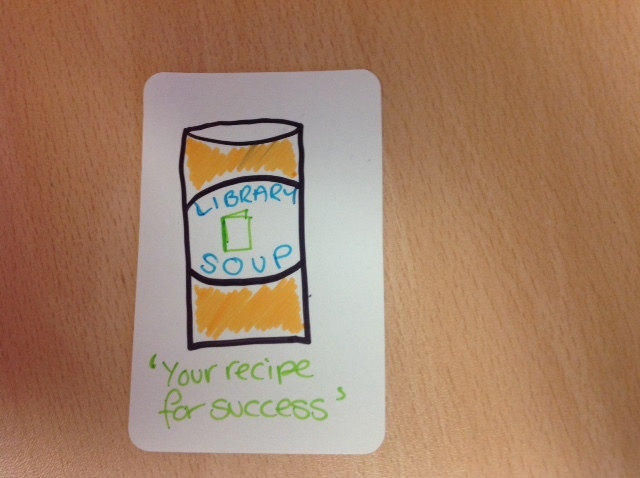 The group I was in created a ca rd game called ‘Library Soup’, where each player was given a ‘recipe card’, representing an assignment that they had to complete with five visits to the Library (five turns). 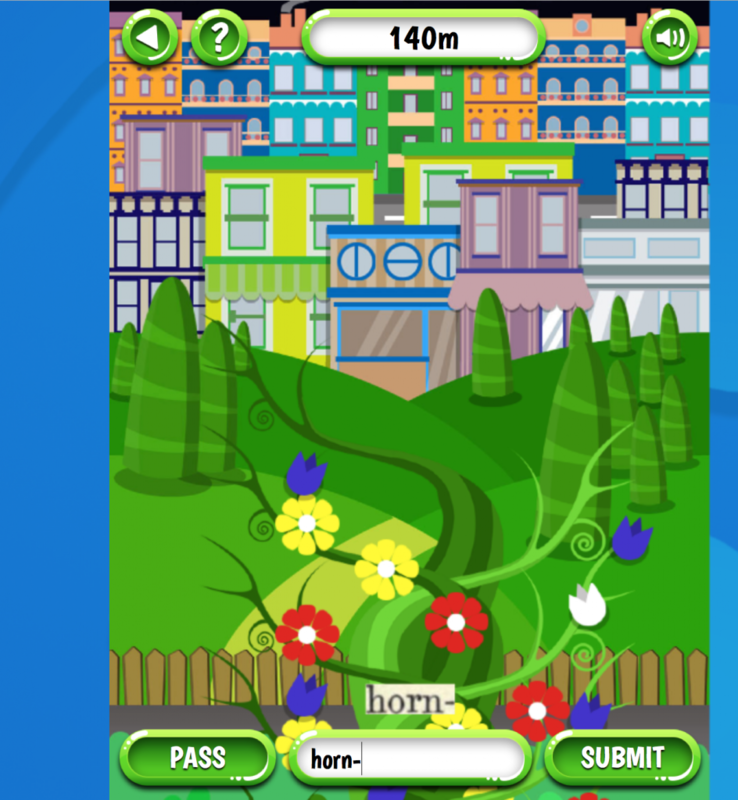 The player with the highest points at the end was the winner. 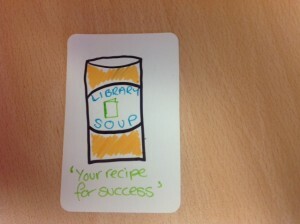 The aim of the game was to teach the players that not all library resources are equal. As the assignment could be completed with resources with low points, e.g. a magazine article or high points e.g. a peer-reviewed article. 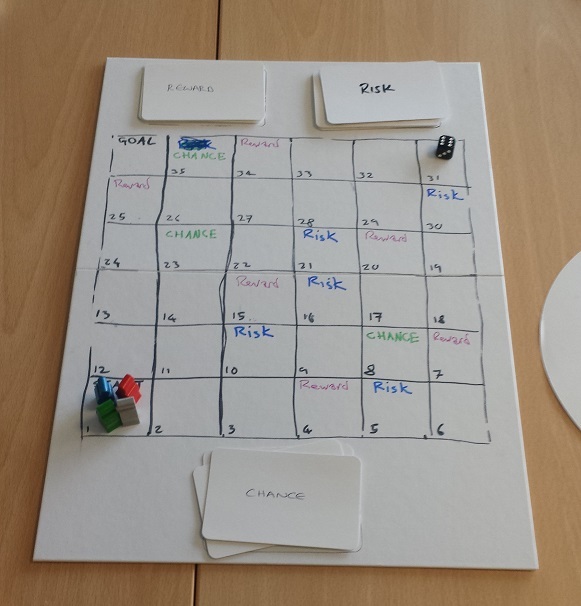 Gavin and Matthew’s team created a board game called ‘Find-It‘ to encourage users to discover resources in their University Library. Players started off at the library entrance, drew cards to see what items / resources they had to locate and then searched for these in the physical and digital library space. The game aimed to raise awareness of the diversity of library resources available while orientating students around the library building. In Caroline’s teams game ‘Database Ace‘ players worked their way up the board picking up reward, risk and chance cards. The cards taught users about the use of online database in their assignments. Andrew, also gave us an overview of ‘Lemon Tree‘ a rewards based application developed in partnership with University of Huddersfield Library, which gives users points and badges for library activities. 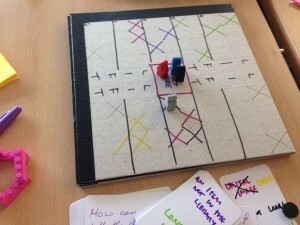 Videos of all the games designed on the day are available on Andrew’s Blog . 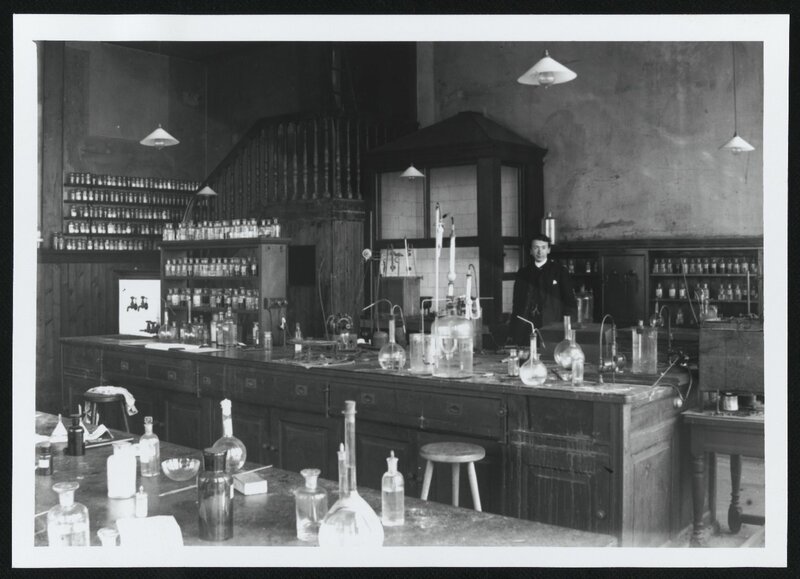 Welcome to the University of Edinburgh, Library Labs Blogs. This site will be used to keep you up to date with experimental work and projects undertaken by Library and University Collections.